When I was growing up, I can remember racing home from school every day in the hopes of catching either Speed Racer or Starblazers on tv. I can’t remember what time they came on but if I was held up in any way, I would miss them. And there were times when the shows weren’t on and I felt the afternoon and race home had been wasted. Maybe you remember those days or maybe you don’t but the times that the shows weren’t on were the days that they played an after school special. The reason I bring all that up is to set the tone for this discussion. 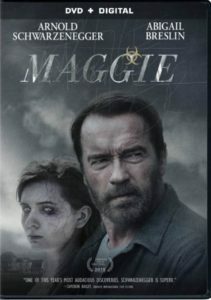 I recently saw the movie Maggie, starring Arnold Schwarzenegger (2015, directed by Henry Hobson). It is listed as a horror/drama, and that is stretching the terms pretty thin. The basic story concept plays out in a zombie apocalypse. Those infected with the disease are put into concentration camps and killed off when they succumb to the effects of the disease. Granted this isn’t a mandated camp. Generally, the people put in them go of their own free will or family puts inters them to save themselves the pain of watching them die. The story line plays out with Maggie (Abigail Breslin) who has been bitten and her father (Schwarzenegger)who watches her go through the stages of the disease. With that in mind, I want to say flat out, the whole concept of zombies in this story line is a McGuffin. The sole purpose for it to be in the story at all is to give the story a vague sense of otherness. And this is where the after school special comes into play. You could simply trade out the zombie plague with something more mundane like AIDs and the movie wouldn’t really change in any meaningful way. They give us melodrama with a thin plotline and hope the actor’s names will do the heavy lifting. Which brings us to the cinematography. The movie is cast in dim greys. Sure its shot in color and all that but the tone is one similar to a grey day just before a cold fall rain. Sure the director is using the different elements to bring together the aspects of the story but the story itself is so week and transparent, that it all does little more than highlight how weak the package is. As I sit here thinking about the various elements of the movie and how they all play together, I realize I could dig a bit deeper into the thing. But, I don’t want to go much further where I would be sharing too much of the story itself. I mean you may want to experience this (insert word of choice) for yourself. For me, the movie was a waste of time. Often when I talk about movies I will watch them several times (even when I have seen them countless times before) before I do a write up. I had to give up before I was a quarter of the way through on my second viewing. At that point the flaws were so glaring to me that I couldn’t see spending that much more of my time with it.